Today's post is a little different from normal but in a good way I think. One of the things I've loved about blogging is talking to all you wonderful people out there. Whether it be via comments or my personal favourite, twitter. One of the lovely ladies I tweet to on a fairly regular basis is Ella from BelleVintage. Last week Ella opened her very own online shop which sells a fantastic collection of vintage treats. 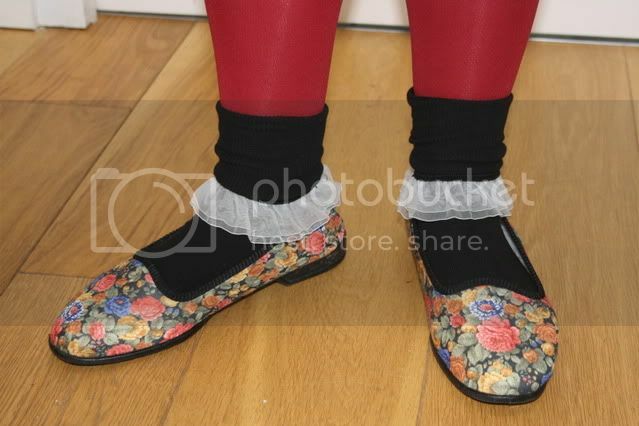 I bought these wonderful floral pumps on opening night. They are so comfortable to wear and arrived only a couple days after I purchased them. Fantastic business! 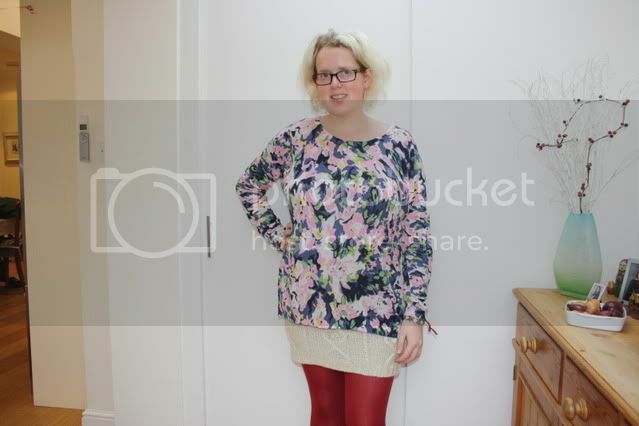 I got this skirt for Christmas and it's really woolly, almost like wearing a snood as a skirt, I love it! The socks were a sale purchase and I just adore the frilly detail on them! This outfit is pretty random but I was in a sort of random mood that day and felt like being a little less boring outfit wise for once. The pictures was actually taken just before I went to the hairdressers. Getting back to the point of this post... Ella asked people on twitter to choose an item from the shop and style it anyway we liked. Keeping with the vintage theme I choose this cute mustard jumper and created a look I think fits in with the style of the shop. This was the first time I've used Polyvore and I think I might be addicted!!!! Midi skirts are all about at the minute and can look quite vintage if the pattern is right hence my idea to wear Ella's top tucked into this floral number. With some cute socks and shoes, a scarf worn in your hair and pretty jewellery I think this would be a nice outfit for the spring. Because I'm all about the bows I've also added this cute little brooch for an extra girly detail. I hope you like what I've created and please do go and check out the BelleVintage shop, it's a lovely place to explore and indulge yourself! In other news, I thought I was meant to go to the dentist today. I got there but was told my appointment is actually for tomorrow, my dentist doesn't work on a Monday! We're going to Ireland tomorrow until Friday which means I had to rebook the appointment for next Tuesday which means another week of nightmares, what fun! Those shoes are so cute! I will definitely gave to check out the site. I love the mix of florals in your outfit. OOh I like how you styled the skirt with the sweater, especially the fact that the skirt doesn't have any obvious yellow/mustard in it (as far as I can see )./. I'm not too big on matchy matchy! :) Whereabouts in Ireland you going? Although not a huge fan of River Island, in their sale they had so many mid length skirts I was suprised! Absolutely love them :) Just wish they suited me more! Cute socks! The snood skirt actually looks really warm and probably would be more so if it is longer but it would be weird longer too. I have a pair of shoes like that from a jumble! I'm never convinced that they're not actually slippers but they've got a hard base so who cares? I love them on you! Love the floral pumps. They looks amazing. The mustard jumper is so cute. I love how you styled it. Have some cake, just don't have lots! I don't like really restrictive diets, they make me crave things so much more. I really like that outfit you've put together but I like the one you've got on even more. The skirt is GREAT! Colorful designer dress.. Love it..
the skirt is amazing, very 'in' at the moment! aww thanks soo mcuh for the lovely comment :) oohh i rea<lly like ur jumper!